There once was a man who lived in Carroll Gardens. Every week, from Monday to Friday, he walked an hour and five minutes across the Brooklyn Bridge – in rain, snow or broiling heat — to his office on Wall Street, where he worked in global insurance. At the end of the day, he walked home again. He loved his home and his commute and he did very well. So well, in fact, that he retired a young man. Wanting to give back to the community, he opened a consignment shop on Court Street, so people could sell quality items they didn’t want or need anymore, with hopes of giving those items a new life. All the profits would go to charity, including local public schools. That man is Alex Grabcheski, and his store is Fork + Pencil, at Court and Warren, a small shop stuffed to the gill with all manner of antiques and fine items — from mirrors and oil paintings and frames to jewelry and glassware, silver and china, posters and planters, and handmade greeting cards. In the back of the shop, and spilling out onto the Court Street sidewalk, is Grabcheski’s plastic-free toy store, an excellent assortment of games, books and toys, including a healthy Melissa & Doug selection. 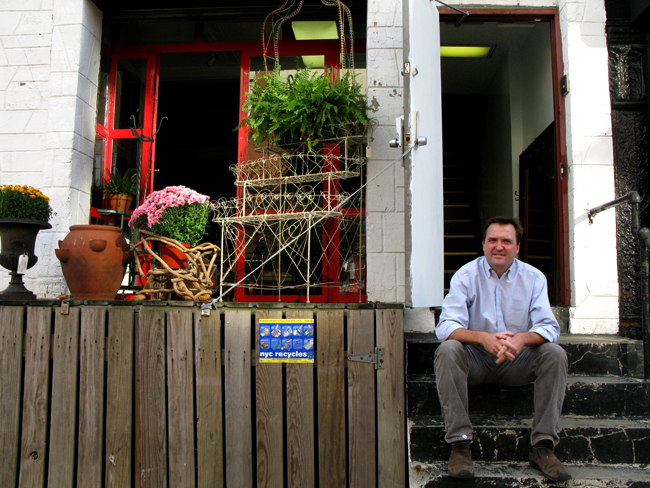 During his first year of operation, from 2009 to 2010, Grabcheski donated more than $10,000 to charities, including the Council on the Environment of New York City, which sponsors the city’s Greenmarkets, the Rooftop Films organization, a group that preserves heritage vegetable seeds in upstate New York, and Village Health Works, which provides medical care to an impoverished community in Burundi, Africa, among others. The shop donated thousands of dollars worth of merchandise to the local public schools. The idea to run a for-profit business and give the profit to charity came to Grabcheski and his wife from Newman’s Own, the food company started by Paul Newman and his wife. Newman’s Own has donated more than $300 million to thousands of charities since 1982. Fork + Pencil has done so well, in fact, that this summer Grabcheski opened a 3,000-square-foot warehouse at 18 Bergen Street in which to display antique furniture. On a recent sunny fall day, I visited to check out the goods. On display were a $275 faux-leopard-fur lined 20th century chair, a beautiful and large $375 wood mid-century lamp, and a $45 green spun glass pitcher. The vibe was very laid back, as Grabcheski chatted with a man selling toys for Christmas. Damien, who works in the shop, told me that the showroom has been frequented by Manhattanites tired of the “scene” and by set designers on a budget. Recently, a Vogue Magazine designer, who’s been a frequent customer, rented a couch for a photo shoot. Grabcheski gets items from estates, local residents and from people as far away as Maine and elsewhere. The cool thing is that you could go into Fork + Pencil a dozen times, as I did, and not know about the charity angle. I learned about it when I overheard a woman asking Grabcheski about the non-profits he supports. Grabcheski’s family is from the New York area and he has lived in South Brooklyn for 15 years. I love this – from someone who was born and lived at 254 Henry Street my first year of life. I love antiques and helping others…. this is great!! !